Last Sunday, we were preparing for a steamboat with some friends over our place. So we had to go do groceries. 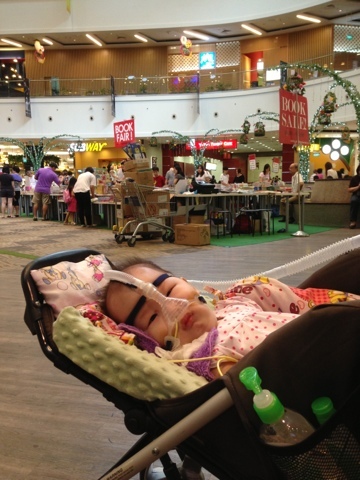 Wife stated this was a good time to bring Kaelyn out as the past week she has been cooped up at home because of the bad haze going on around singapore. I am adverse to bringing her out to shopping malls as I am afraid how easy virus can be passed in such closed up areas and with crowds. But seeing that the time was earlier in the day, I am game for it. So we brought her out to Changi City Point. Bad start. We forgot her stroller’s undercarriage basket. This is used to carry her Bipap and the back up battery. We almost wanted to turn back home. But we decided to lie Kaelyn on the other side of the stroller and squeeze the Bipap with her legs. Anyway she will have a better view of the surrounding in the stroller this way. We kept the oximeter away in the bag as there was no real estate to hang or place it. We just monitor her facial expression. We wanted to have our breakfast too so it restricted our choices of eateries and seats. Thankfully we got a seat just at the entrance of the eatery, so the space for her bigger than usual stroller was sufficient in this case. Kaelyn was in good mood. Maybe she just felt “YEEESSSSS!!! OUT OF THE HOUSE!! !” kind of feeling. As we did our groceries, she waved hi to a staff who was beside her arranging the shelves. For the first time other then at the hospital, a man came up to me just asked me about how is her condition and stuff like this. She too, gave this man her best wave of hello, goodbyes and smiles all around. Feels kind of weird to have someone come up to you to ask about her condition. Maybe that’s another reason I keep her away from the mall. Just a picture from today. No smiles at this point of time as she is nearing her nap time.